I absolutely loved the first film but this sequel lacks of solid storyline; and I believe that almost the whole story in the movie is fictional. The plot is predictable and overused. The last film I seen that has the similar plot and message was Fearless. The acting of the supporting casts such as Huang Xiao Ming, are absolutely terrible. And I dunno why he resembles Shawn Yue so much in this film. He looked so different in The Return of Condor Heroes ’06. However, I have to admit that the fighting scenes are awesome especially the final fight scene. The movie also managed to ignite the hearts of the people who were watching in the cinema with me. The little jokes and insults got everyone involved emotionally. The whole cinema cheered and applauded after the final fight scene. The message of the movie was really clear and everyone should respect that regardless of whether or not you’re a Chinese. Through the film, we learn the difference between Ip Man and Bruce Lee. Ip Man practiced martial arts as a hobby and as an exercise before fighting for peace, harmony and justice; the latter, as we all know, practiced martial arts to send a message to the world. Verdict: Not as good as the first one but still good for some laughs and martial arts action. But I strongly believe that only Chinese would truely enjoy and understand the meaning of the film. Favourite scene: The final fight (lah, duh) between Ip Man and Twister. 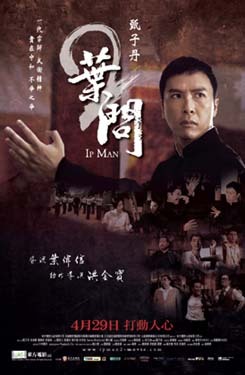 IpMan2 is the best movie of 2010. IRONMAN2 was sort of boring in the middle part but it's way better in the scene before ending (: Yet to watch IPMAN2 though! I really thought that Ip Man 2 was good. I didn't catch the first one though. But the 2nd one in my opinion was really good. Like you say, the message was there and I think everyone who watch it got a little on fire when Twister insulted the Chinese. @jfook I sure hope you're being sarcastic. @hilda You should watch it soon because it may not be as exciting to watch at home. @jas There is one thing that it certainly does not have: an original plot. @mich If you liked this one you'd definitely love the first one.